The updated version of Skechers Performance's racing flat has arrived! 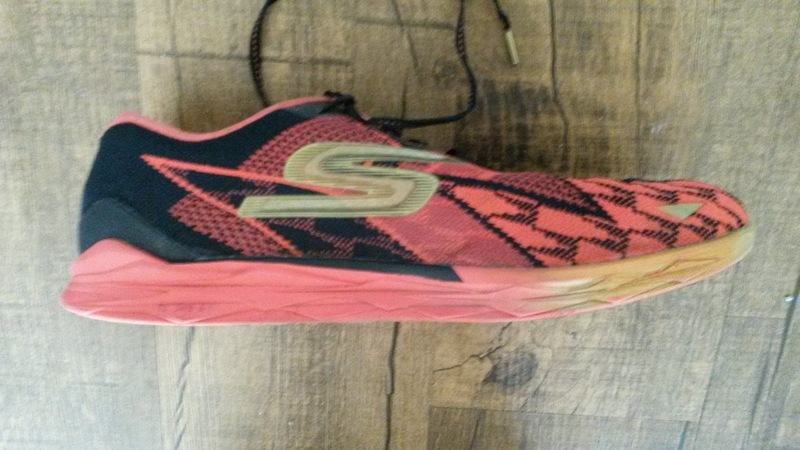 I reviewed both the Skechers GOmeb Speed 3 and Speed 3 2016 in a dual review HERE. 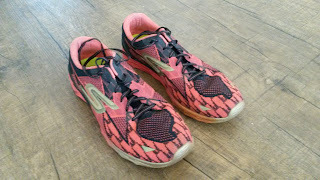 I loved both previous versions and found that while they were not the lightest racers out there, they proved to be fairly durable, fast, yet protective (managed a 15:20 5k to win the Angels 5k last year in the Speed 3 2016). Meb Keflezighi has been seen for some time rocking version 4 in races and recently at the Olympics. This shoe has been developed with his gait and biomechanics in mind, but will also work for a good number of runners. This GOmeb Speed 4 has been completely redesigned from previous versions and we have a great deal to talk about. So let's get to it. 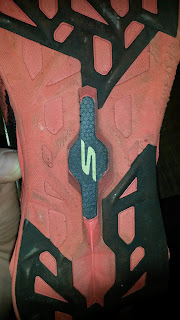 As with many Skechers Performance shoes recently, the M-Strike midfoot bump is gone. In place is a smooth outsole that is almost full contact except for a cut out (through which you can see the Dupont Delrin plate). This was immediately noticeable and even walking in the shoe feels much smoother than previously with the flatter outsole. The podular outsole has been removed and in place a web like design of durable outsole material in the forefoot and heel put in. This new outsole material is both grippy and extremely durable. 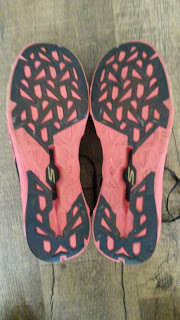 After ~70 hard miles in this shoe I have very little wear on my pair, which is great for a pair of sub 7oz racing flats. 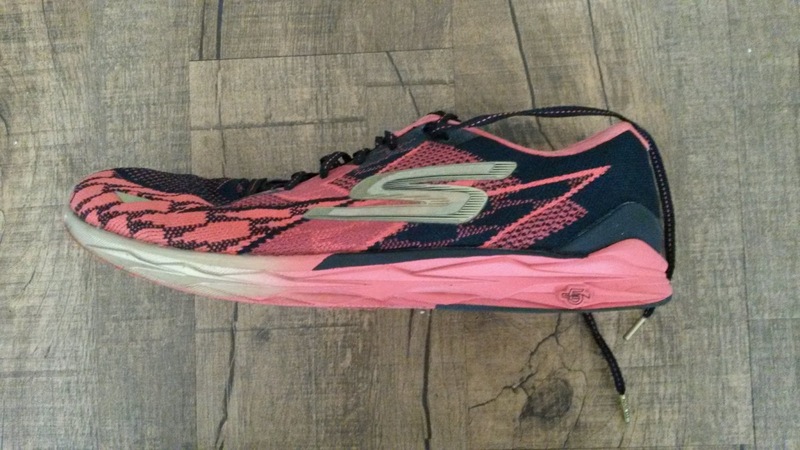 Although Skechers Performance lists the GOmeb Speed 4 at 6.9 ounces for size 9, they feel lighter than the previous versions. Running Warehouse has them listed at 6.6 oz and that feels about right to me. This shoe has lost some weight and even looks smaller. The outsole design is far more foot shaped than previous (although the upper is slightly different) but the plate feels like it extends farther posterior (back) than previously. The heel and midfoot are fairly stiff due to the decreased midsole material and can be felt best during midfoot and heel landings. As always, I will not start a footstrike debate on this blog, but for those with a more posterior landing, this shoe will feel awesome and that plate will propel you forward. The midsole in general is much firmer than previous but is still surprisingly protective. My first run in these was a 14 mile long run with 4 miles at tempo (5:20-5:30 pace). The tempo felt great and the firmness definitely helped me kick into gear. This is definitely more of a long distance racer as it seems to excel at longer repeats and workouts. The posterior reach of the plate and the toe spring does not make this shoe great for sprinting as the firmness of the forefoot feels better rolling off than landing on. I have not enjoyed high speed workouts in this shoe, but longer workouts have been great. The position of the plate in the midfoot/heel again acts like a mild stability element. The plate slightly blocks the diagonal/lateral motion normally associated with the subtalar joint (where most inversion/eversion and pronation occur). Thus like previous versions, this shoe does provide mild stability which even neutral runners may appreciate in later miles. That being said, due to the increased firmness in the shoe, many runners may find this shoe is better suited to 5k-HM at most. 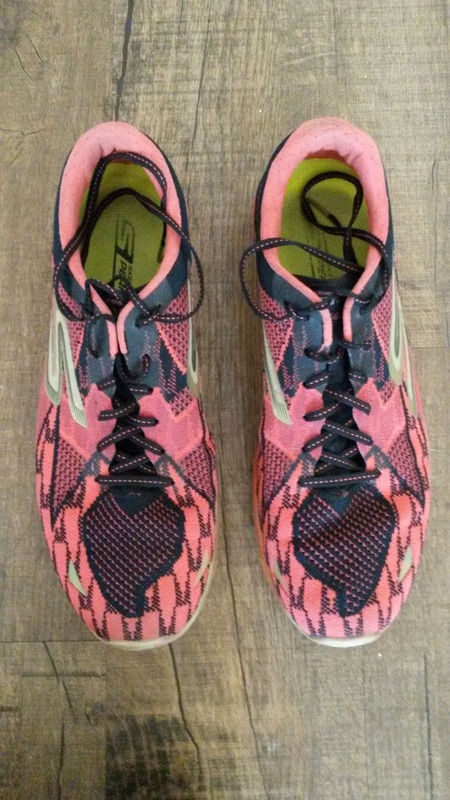 For those used to doing marathons in the Saucony Type A6 and shoes of that manner, the GOmeb Speed 4 would serve as a fairly awesome replacement with some additional kick from the plate. Unlike the A6, there is not as much flexibility due to the plate, but this is somewhat made up for by the mid-level toe spring (not extreme or mild). A slight issue I am having with the posterior placement of the plate is that it feels like the shoe is unbalanced and biased toward the back of the shoe. This makes landing farther forward during sprinting difficult and odd, which further contributes to this feeling more like a distance racer (despite the increased firmness). I know I sound like I am contradicting myself, but this shoe likely will work best for 10k-HM with the occasional 5k due to the lighter weight. Like previous versions, the drop remains at 4mm. Due to the lack of the midfoot bump (M-Strike) and increased midsole firmness due to the switch to the 5Gen material, the GOmeb Speed 4 feels even lower. I did not have any strain on the achilles that I normally associate with lower drop shoes even with long miles, but that may be due more to my extensive work on ankle stability, calf length and strength recently. 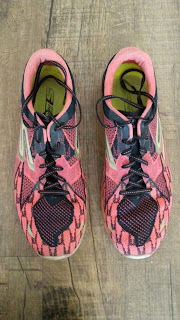 Although the upper of the GOmeb Speed 4 continues to be GOknit, the fit is far more aggressive. While the GOmeb Speed 3 2016 fit about a 1/2-1/4 size large, the GOMeb Speed 4 fits very true if not a 1/4 small. I would definitely try this shoe on before you buy it. The upper density has been increased quite a bit and now holds the foot very well in place. However, this also causes the upper to be a bit stiff for the first 10-20 miles. It does break in, but do not expect the flexibility of the previous version. Despite the increased upper density and firmness in the forefoot, the upper in the heel and midfoot have been softened quite a bit in an effort to make sockless wear more comfortable. Does it work well? Yes. I have worn this shoe sockless for many miles and have never had an issue in the midfoot or heel. The increased firmness in the forefoot upper has always made me nervous but has never given me any hotspots or blisters. So can you wear this shoe sockless? Yes, but do so at your own risk. Everyone has different feet. The whole shoe fits much snugger than previous versions. Yes this is a racing flat, so don't expect a wide fit. With the new upper snugness, the shoe will do best on the feet of medium to narrow feet. There is actually a Dupont plate utilized at the posterior lateral and medial aspects of the heel. It can been seen surrounding the heel area and comes up on both the medial and lateral sides. This does not dig into my heels at all and does a great job of guiding the heel straight during landings without the traditional jarring landing of midsole posting. As with the midsole plate, the stability is mild and will likely not dig into anyone's calcani. The actual heel counter itself is very mild, flexible and is adequately padded. So for those with sensitive achilles insertions, this may be a great shoe to look at as many racing flats can have very stiff heel counters (ie Adidas). 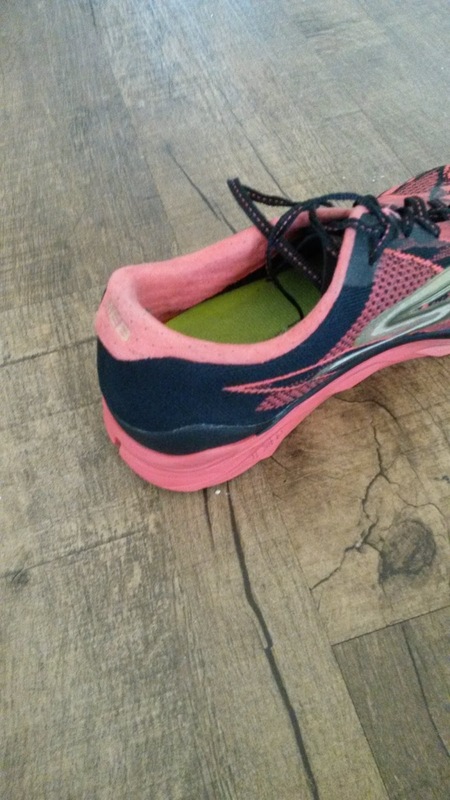 As with many racing flats and with previous versions, the GOmeb Speed 4 does not have an achilles dip. 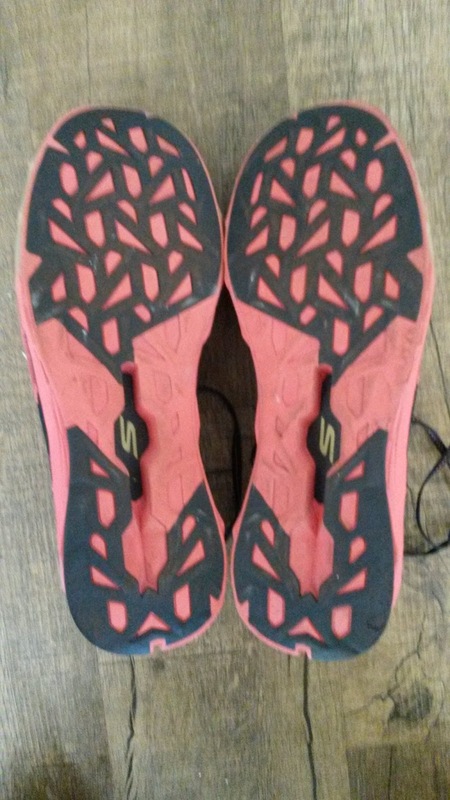 This only caused minor rubbing during that initial tempo/long run (I was wearing the shoe sockless) but the material choices Skechers Performance seem to be using in the midfoot and heel are soft and comfortable against the skin. The laces and overlays do a great job of locking the heel in place and tightening them will put a better hold on the heel/midfoot than the forefoot. There are also overlays in the form of the Skechers Performance logo that do not look like they add a snugness factor to the midfoot, but upon try on definitely help out with that aspect. Unlike the midsole, the upper does taper a little more than the previous version. Again, this is meant to hold the foot snugly, but those with sensitive toes may want to try this on first due to the increased snugness of the upper as well. I appreciate the increased ground contact in the outsole as that is a great way to improve stability. The GOmeb 4 does that, although as mentioned earlier there is still a split for the Dupont plate to be seen. I am not sure why many companies do this unless it is a way to showcase their technologies or offset the loss of flexibility from the plate in that area. The current placement of the plate does mimic the plantar fascia's origin at the calcaneus. However, in my opinion the plate does not extend far enough to truly mimic this amazing body structure. The current Dupont plate feels like it ends in the anterior midfoot area but does not extend all the way to the metarasal heads, which does decrease energy transfer pushing you forward. The plantar fascia functions to transfer forces from the gastrocsoleus (calf) muscle through the achilles tendon to the forefoot (as well as holding up the arch and providing mild stability in conjuction with the posterior tibialis, anterior tibialis and intrinsic foot muscles especially those related to the 1st toe). It is an energy transfer structure, which works very well unless you attempt to add excessive frontal plane (lateral) motions and stability needs, which is where it can become sprained/irritated. If the plate ends too early, the forces from the calf will not be appropriately pushed into the forefoot and maximally assist with toe-off/terminal stance as the forefoot rocker helps roll you forward during that propulsive phase. 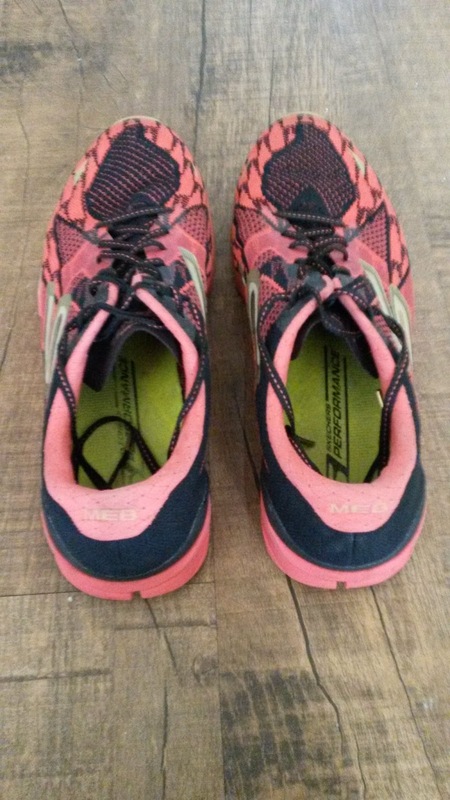 In the case of the GOmeb Speed 4, the plate does feel like it ends early, which hopefully will be changed as it not only makes landing odd for sprinting and forefoot strikes, it keeps a majority of the weight in the posterior section of the shoe (as mentioned earlier). Many Mizuno shoes feel like this, which is why they usually do not work for me. If you like that kind of ride, this shoe will work for you. This may be changed in the production versions, but I would like to see that upper around the forefoot made a bit more flexible to mold to the fit a little better. The upper does break in to a degree, but still feels very stiff initially. Personally I would move the Dupont plate forward, starting in the midfoot and going into the forefoot rather than being farther back. I believe this would make the shoe feel faster and give a little more pop during terminal stance/toe-off. Currently the posterior placement puts more weight at the back of the shoe, which as mentioned previously makes it feel a bit off balance. Overall the update feels, looks and rides firmer and a bit faster than the previous version. The new version looks awesome, but the increased firmness brings down the versatility of this shoe a bit to more 5k-HM in my opinion. Obviously different people will be able to handle different things, but I personally would not take this shoe above a half marathon. The new placement of the plate (or what feels like a new placement) will work VERY well for those that land at the heel or midfoot. For forefoot strikers, you may want to look elsewhere as the weight of this shoe feels farther back and can feel a bit odd running at high speeds. Those who land farther back, are looking for a lighter (6.6oz), firmer racing flat with a propulsion plate shoe definitely give this shoe a look! These shoes were provided free of charge in exchange for a review. This did not in any way influence or affect my review and views of this shoe. I put at least 75 miles on trainers and 25 miles on racing flats. Currently I have one pair of GOmeb Speed 4s that have at least 70 miles on each of them. A big thank you to Skechers Performance for including me in the development of such cool new serious running shoes. Look for them to make some big changes in the Running Specialty market in 2017-2018.